Do you stare in amazement at the well-behaved German Shepherd puppy at the dog park listening and following his owner's commands while your puppy is off wreaking havoc or dragging you all over the park? Are you sick of your adorable little German Shepherd chewing everything in sight? Are you tired of your puppy leaving “surprises” all over the house? Do you want to teach your new puppy how to sit, stay, or heel? Does your puppy whine or howl uncontrollably when you leave the house? This ultimate German Shepherd training guide can help you with it all! Everything you need to know about German Shepherd training and basic obedience. This audiobook is guaranteed to answer any of your questions about training your German Shepherd and is a must-have for anyone thinking of getting a German Shepherd puppy. This is the ultimate guide for all German Shepherd puppy owners and individuals who are thinking of getting a German Shepherd puppy. Don’t wait any longer! Get this audiobook and turn your puppy disaster into that perfect dog you’ve always dreamed about! I have to give the author and the vendor a huge Thank you. German Shepherds are a very easy breed to train however, they can be a handful and can get themselves in trouble as a puppy (e.g. chewing, destroying furniture etc.). This book helped me so much at each stage of his development. The author hits it right on the nose with the timing of what ages they can become difficult. This book gives you great advice that will coach you through all the tough times you might have with your new pup. This is the most crucial time in training, when they are puppies, so you owe to your sanity and your dog to get this book. Believe me! So many poor dogs go to shelters and get put down simply because the owner didn't learn how to care for the dog. The fact the your reading this proves that you have the dedication it takes to own a dog. Buy this book you won't regret it. I wish a you new puppy parents the best! It can be difficult, but the joy a German Shepherd can bring to your family once well trained is well worth the effort. Great reference book for GSD owners. Ordered several GSD books and puppy/training books, and this by far was the best one for learning what to expect at different developmental stages for a German Shepherd. I've owned big dogs before, but Kona is my first GSD. I'm finding the book well written and extremely helpful. I refer back to it constantly and refresh my memory by re-reading it as my pup reaches each new stage. While there are similarities in raising puppies generally for all breeds, I can tell my GSD is way different from my lab, whom I raised from puppyhood as well. After owning a retriever who instantly knew how to fetch, I had no clue how to teach a dog to actually retrieve! Socializing also seems even more important for the GSD compared to other breeds. The GSDs seems to receive a bad rap, because there are so many dogs who have not been socialized properly from the start. Definitely higher needs in this area than my lab. I'm glad I got this audible book and would recommend to any new GSD owner. The info is very useful and well organized. I like the fact that you don't have to listen the whole book at once. The info is broken down by the age of the pup. So if you have a 4 month old pup you can just read that specific section and most of the info about your 4 month old is right there. Wonderful book couldn't have survived without it! I love love love this book. It gives you a month by month review of what behaviors your German Shepherd will have and you go into the month thinking nope not my fur kid but wait for it because they develop those behaviors and the book gives you ways to deal and train your puppy. This is an absolutely wonderful companion to have when raising a German Shepherd puppy and it's filled with wonderful information. I find myself reading a month ahead and then going back and re-reading the chapter of the month my puppy is in. I highly recommend this book. It has a lot of good information. Many helpful tips. Since its set up month to month you don't feel obligated to read the entire thing all upfront. We've trained another dog previously and it still had some training ideas that have been helpful and didn't know about. A must listen for any German Shepherd parent! I just purchase this book. We are bringing our pup home in 4 weeks. I love how this book starts out from birth and up so we can know everything he has learned and how all of his experiences affect him. I also love that it talks about questions for the breeder. Perfect for a first timer like myself. Learned a lot so far from this book and it's laid out in a concise, strait forward manner. Easy to listen and understand. A perfect heads up for what to expect from this special breed of dog and how to handle issues. My son is getting a German Shepherd puppy in 2 weeks and this book will be a very valuable resource. This book has been a life saver. A German shepherd puppy very recently became a part of my family and I immediately purchase this audio book in an effort to overcome my complete inexperience with dogs. I was able to blast through the chapters on the early months for the information I needed immediately and I have been very pleased. There are suggestions and clear instructions on every aspect of caring for my puppy and ensuring that she is happy and healthy not only now but for her entire life. This was helpful prep for German Shepherd ownership - it's easy to listen and has helpful info. I don't agree with their training style, but I do like having their outline of what to focus on when, what to expect each month, etc. Definitely recommend it! 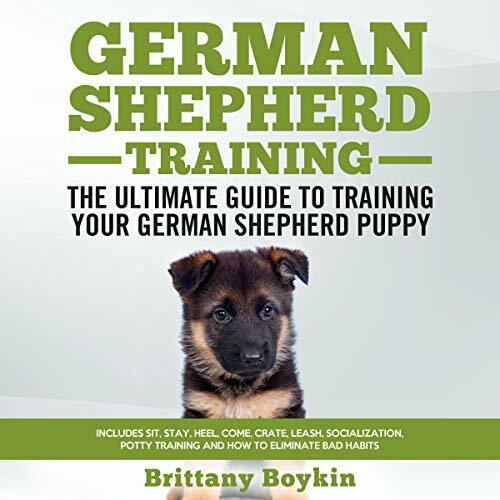 I purchased this book for my wife to help her with his German Shepherd puppy. she says that it's been very helpful because it tells you what to expect with your puppy in detail each month of age. It has been of great help to her. I see her m with the book in his hands listening quite often. If you are not familiar with what to expect with your German Shepherd puppy then I would suggest that you invest in this book because you will be glad that you did! This has the best month to month information I have found for German Shepherds. We are currently training our 10th & 11th GS and I wanted to make sure we covered all the bases since we now live in a rather remote area and do not have access to a good trainer. I do not necessarily agree with 'treat training' because in our situation it is not practical, however, everything else is well written and researched. We did begin basic training immediately so our two pups are well on their way with basic commands at barely 5 months. This will be a book that will stay in our audio library. This book came highly recommended to me from someone I train dogs with. I will preface this by saying I grew up with German Shepherds and am not wholly inexperienced with the horrors of puppy teething and teenagerhood. That said, I wanted to pay more attention to the stages of development and training at an age-appropriate level. This book as a good layout and breaks everything down. It has served as a great way to remind me of what to expect so I don't throw my dog out of the house when he's driving me crazy as he grows. Wish we'd had this book years ago!!! Not just another month-by-month book. Even though we've shared our home and raised GSDs for too many years to remember, we learned even more from this wonderful book. It's actually about the German Shepherd dog breed! Highly recommend this one!! This book has more info about a German Shepard dog than I expected. It has been very eye opening to us in the areas of what can be expected of my puppy on a monthly basis. Pretty accurate book. Our GSD accomplished some things much sooner than how they’re listed in the chapters. A good reference book for first time GSD owners. Few month ago we purchased this audiobook before we brought home our first German Shepherd. This was the best book I have read. I continually go back to look things up. it has been a while since we had a puppy and this book hits the nail of what to expect each month! My 15 year old son uses it regularly he is training the dog.